Poetry slams, mixed tapes, kicking rhymes, and Ina? That's right. Ina Coolbrith is the first subject of Liam O'Donoghue's new podcast East Bay Yesterday. The 30-minute segment, "Oakland's first 'celebrity' librarian," is based on my book and a two-hour interview I did with O'Donoghue in Oakland. 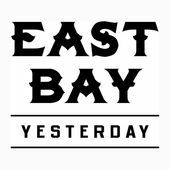 "East Bay Yesterday is about history, but it's not stuck in the past," he says. He is so right. His language pops, and I love hearing him tell Ina's story. Take a listen and then subscribe to the podcast. It's free! Each week O'Donoghue will share stories from Oakland, Berkeley, Richmond, and other East Bay towns. "Expect to hear about everything from soul food and blues clubs to redwoods and riots," he says.